Pick up the bucket and place it on the holder underneath the left faucet. 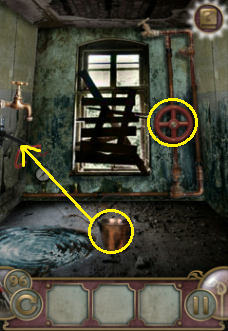 Tap the red wheel to turn on the water. Tap and hold right underneath the bucket to cover the "hole" and wait until the bucket is full and you see the key. Take the key and open the door.